Have you ever heard of an inflator that has a pressure gauge which glows in the dark? 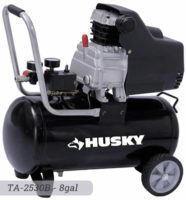 Yes, this is one of the features that makes Husky 120 Volt inflator unique. The analogue pressure gauge was designed to allow users to see the reading even in the dark. When you have a flat tire on the middle of a dark street, you can still use the machine to inflate your tire because of this glow-in-the-dark feature as long you have an outlet. Aside from vehicle tires, the inflator can also be used for bicycle tires, air mattresses, and sports equipment. In fact, the tool already comes with a mattress nozzle, sports needle, and Presta valve adapter for your convenience. You get all these in a single package worth $29.98 in Home Depot. Other small things that can be inflated by this machine include pool toys, garden or lawn tires, golf cart tires, and many more. Because it is a 120-Volt inflator, it is equipped with a fast and powerful direct-drive motor. Just plug it into a standard 120-Volt outlet and you are good to go. It runs quietly which is beneficial for consumers who prefer to work indoors. 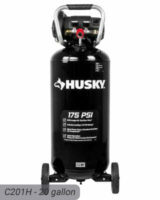 The maximum pressure of Husky 120 Volt inflator is 130 PSI. This is not strong enough for other heavier tasks but is very much appropriate for light and simple tasks such as the aforementioned. It can inflate even a tire of a small truck but it would take some time. However, for smaller objects such as basketball and football, the pumps are excellent. The inflator is very portable so you can carry it with you easily. It even has a handle which adds to its portability. With an assembled height of only 40 inches, you can put it in your car compartment or squeeze it to your workbench with all other equipment. It is a lot more compact than other models. The length of the power cord is around 24 inches which is enough to keep you at a distance from the outlet to the object that you will inflate. The length of the hose is 28 inches which is long enough for garage or indoor use. The hose is made of rubber so you need to be very careful as it is relatively prone to leaks. Make sure that you check this part and have it replaced as necessary. 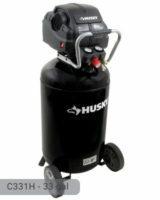 Also, the connection between the air hose and compressor must be carefully handled because it can be easily damaged. As mentioned in the warning sticker of the product, it can heat up to a certain level which can damage the air hose. When using the inflator, check its temperature once in a while. Also, check the pressure level which can be easily viewed through the pressure gauge. The machine is very easy to use with on/off switch that makes it quick to control. 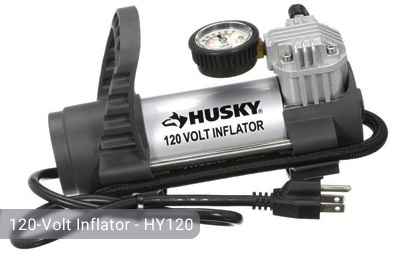 If you want a sturdy, lightweight, and powerful inflator for domestic purpose, Husky 120 Volt inflator is perfect for you. If you already own this 120-Volt inflator or just want to buy it you can share your review or ask a question through the form below. Hi, I bought the 120v inflator last year. Now the air hose is broken 2 places where it curved and clipped to the body. Where can I get the replacement hose? Should I take it back to Home Depot and exchange for a new one? Rubber air hose is cut by sharp edged hexagonal ‘clamp’ on third use. Seems to be a common complaint. Air hose broken where it comes out of the compressor. Any place I can get a replacement hose? It’s less than a year old. Can I get a replacement hose for my compressor? 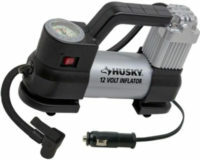 Husky 120 volt inflator. If so where can I purchase one? I have the same problem as above. Where can I get a replacement hose? I have the same problem as all above. Where can I get a replace hose? This just happened to me. The black metal is very thin, just peal it off with a pliers. Pull the remaining piece of rubber off. Make a new clean cut what is left and slide it back on. Then put a hose clamp on and tighten it up. Done, at most it will take 10 minutes. My hose broke where it comes out of the compressor too. I have not handled this equipment irresponsibly. Husky should have a replacement for such shoddy parts. Same problem. Can’t seem to find replacement parts. I will fix it myself. 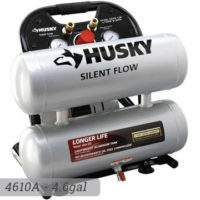 O purchased the Husky HY120 120-Volt Inflator a year ago and used it two times. 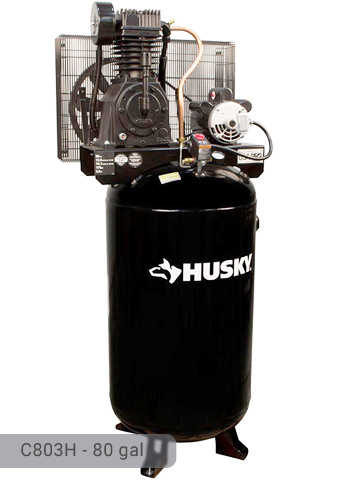 When I went to inflate my boat trailer tires today, I noticed that the Husky hose was leaking air from the fitting that mounts it to the cyclinder. I always keep the hose stowed in the factory position when being stored. That is what caused the hose to crack right at the point the hose turns downward. It is a hard turn which has no caused the hose to be usless. I have not been able to find a replacement hose due to the small size of the fitting. Can someone tell me where I can get one. My hose broke too where it comes out of the compressor. I have not abused it in any way. Husky should have a replacement available. Mine broke too. I pulled off the metal clip holding the hose on. I went to Home Depot and bought a $0.83 compression clamp (the one you tighten with a screw driver) found in the plumbing isle. I cut the hose off evenly and put on the compression clamp then pushed the hose back onto the nozzle then tightened the compression clamp. It worked!!! My hose broke off where it comes out of the compressor. I searched the internet and can’t locate any replacement parts. Where can I obtain a replacement hose? Same problem. Broken hose where it clamps to compressor. I need a replacement and can’t find one that fits. Please let me know what is available as I am on my second pump and don’t want to buy a third simply because of this damage prone connection. Same problem, bought 2 of these pumps and both hoses split just before they connect to the main body of the compressor. Obviously an issue and I am not finding any way to replace the hose. Very disappointed and certainly will consider this issue when I purchase a replacement pump. The air compressor is very handy, although I have only used it twice. I purchased it one year ago. I wanted to fill a bicycle tire today however, and the inflator hose has a huge crack in it at the joint. I would like the hose replaced. There is no reason this should have happened, I store it in container that has enough room so that the hose is not bent, as it was in original box, and I store it indoors to keep the hose from drying out. Although I took extra precautions, the hose is defective and I would like a replacement. I was not able to repair mine as above and need a new hose with connection; I haven’t seen anything above about new hose part, is there really not one available? Why is it so difficult to find a replacement hose for this otherwise great product.? I have the same problem as all those above, the Husky 120 Volt Inflator works fine, but need to replace in my case a missing filler hose.! WTF.? i have a leak, in the same hose, same place, approx. a year old. Bought at Home Depot because it is a “Husky”, I would like a new hose or new unit, please. Sane problem as everyone else. 4 uses , Less than a year old. Leaking hose. This disposable economy is so wasteful. My hose broke in the same manner as described above by everyone else. Shame on Husky for making such a defective product. This was my second one. There will be no third time and I will avoid ALL Husky products in the future and always keep my receipts. MY HOSE BROKE, TOO. I couldn’t find a replacement so I cut 4″ of flexible rubber hose with an I.D. to surround the original, filled it plastic RTV type material, and then took zip locks to wrap it tightly. After two days I checked it and it works perfectly. I did wrap it with black tape for cosmetics too. Were can I get a replacement hose? Hi: How can I buy nozzles for my inflator? I bought the display model and the box was empty. Thank you! Where can I buy a replacement for a damaged air hose on the Model HY120? GDUKE idea works…..take off the metal connected to the nozzle…. cut the hose off evenly and put on the compression one clamp then pushed the hose back onto the nozzle then tightened the compression clamp. It worked!!! Its broken i got a 2yr warranty where i got it from Lowes what do i do? I have owned three of these portable compressors now. All three have had the hoses fail (two at the compressor body and one the shrader valve pin depressor broke off). Where can I get replacement parts at a reasonable cost? Same broken hose at the compressor joint. Agent said was wear and tear! Used twice. Also said only one year warranty but book says two years. I argued. Agent sent $35 voucher to buy a new one. Will use voucher to make a better hose.